PACIFIC GROVE, Calif. -- Not everyone can afford a round at Pebble Beach Golf Links. But every golfer should at some point tee it up on the Monterey Peninsula. That's where Pacific Grove Golf Links comes in: one of golf's great sand saves. 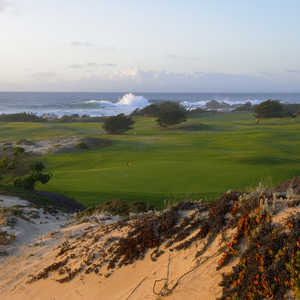 Pacific Grove Golf Links' back nine sits on sandy dunesland beside the ocean. Pacific Grove Golf Links is perched at the tip of the Monterey Peninsula looking out over Point Pinos and the sparkling blue Pacific. The championship course has an interesting layout that combines both parkland and links holes. The golf course begins inland through densely forested areas and then makes its way towards the coast. For a lot of golfers, the thought of spending $100 on a round of golf sounds crazy enough, not to mention $495. Thankfully, the northernmost town on the peninsula lets any golfer get a taste of golf in perhaps the game's most famous zip code. Opened in 1932 and designed by Chandler Egan, the routing of the front nine is a traditional out-and-back. But when the land was acquired to build the oceanfront back side, the clubhouse location moved to the opposite side of the nine closer to the ocean. So instead of a par-5 first and ninth hole, the course begins oddly with back-to-back par 3s, then after a par 4, back-to-back par 5s. While certainly a different experience than the backside, there are some noteworthy holes on this Cypress tree-lined side. The two par 5s are narrow doglegs that require solid ball striking, especially in a stiff breeze. Holes No. 8 and No. 9, a long par 4 and long par 3, respectively, are the front's sternest tests that complement the course's many shorter par 4s and par 3s. But it's the backside, added in 1960, that is the showstopper. After a chip-shot, par-3 10th hole, the par-4 11th plays straight towards the ocean, and in all likelihood, a stiff breeze. No. 12 may be the finest on the course: a long par 5 that plays parallel to the ocean. The firm, rolling and sandy turf makes it one of the best links-style holes on the peninsula. No. 13-No. 17 are also top-notch holes before a short, uphill closing hole wedged between the driving range and access road. Pacific Grove may be the best value in oceanfront golf on mainland North America: Weekend rates for non-residents top out at $52 walking. Greens, while small, are in smooth, consistent shape, which is a testament considering the amount of rounds played here each year. In the peak tourist months, it can be tough to score a prime starting time, though tee times can be booked up to 60 days in advance. 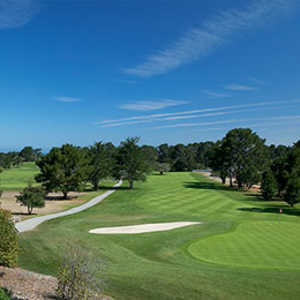 Other affordable options near Monterey to consider in the area are Monterey Pines Golf Course, Salinas Golf & Country Club and Laguna Seca Golf Ranch. Each town on the peninsula is stocked with storybook-like inns and bed & breakfasts in Victorian buildings, not to mention five-star resorts and hotels. But budget-conscious travelers can find options, too, with plenty of motor inns and motels. I found one in Pacific Grove, steps from the golf course, for $78 a night, and there were plenty more in the neighborhood of similar, albeit basic standard. For activities, rather than paying a green fee at Pebble Beach or the other high-end courses in Pebble Beach, pay the $9.75 per car fare for 17-Mile Drive, which is as scenic of a drive as there is in the world of golf. It takes you past Spanish Bay and Spyglass Hill Golf Course, not to mention a brief glimpse of Cypress Point Club. Other sights, such as the Lone Cypress, are spectacular. 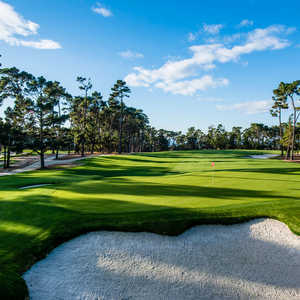 Eventually, you'll arrive at the Lodge at Pebble Beach, where you're welcome to walk down to the 18th green, have a bite in the Tap Room or grab a coffee and be on your way back to Pacific Grove. Cyclists can enter the Pebble Beach gate free, and there are many places in Pacific Grove to rent one.